The first and only time Francis used the papal throne. Francis has been making headlines on only a select number of Catholic blogs with his recent blasphemies and heresies against the Holy Trinity, St. Peter, and Jesus the Christ. Why are the rest of the Catholic media ignoring Francis’ words, pretending as if he never said them? This has been going on for quite some time. It turns out that Francis in only his second day on the job spouted off more blasphemous trash — the Holy Ghost is responsible for the differences between the churches (and by this Francis means Protestants, Orthodox, Catholic, etc...) and one would not be mistaken if they thought that the Holy Ghost was an Apostle of Babel. Thanks to nazareusrex for bringing this to our attention. Thanks to the anonymous reader who pointed out that “si fuera un apóstol de Babel” translates into English as “like an apostle of Babel”. In the original Italian statement, on the Vatican’s official website, which Francis is reading from it says, “e sembra che sia un apostolo di Babele” which translates into English as, “and it seems that he is an apostle of Babel”. Dear brother Cardinals, this meeting of ours is intended to be, as it were, a prolongation of the intense ecclesial communion we have experienced during this period. Inspired by a profound sense of responsibility and supported by a great love for Christ and for the Church, we have prayed together, fraternally sharing our feelings, our experiences and reflections. In this atmosphere of great warmth we have come to know one another better in a climate of mutual openness; and this is good, because we are brothers. Someone said to me: the Cardinals are the priests of the Holy Father. That community, that friendship, that closeness will do us all good. And our acquaintance and mutual openness have helped us to be docile to the action of the Holy Spirit. He, the Paraclete, is the ultimate source of every initiative and manifestation of faith. It is a curious thing: it makes me think of this. The Paraclete creates all the differences among the Churches, almost as if he were an Apostle of Babel. But on the other hand, it is he who creates unity from these differences, not in “equality”, but in harmony. I remember the Father of the Church who described him thus: “Ipse harmonia est”. The Paraclete, who gives different charisms to each of us, unites us in this community of the Church, that worships the Father, the Son, and Him, the Holy Spirit. So exactly how is the Holy Ghost almost an ‘apostle of confusion’? The Holy Ghost is the Spirit of Wisdom. It is the third person of the Blessed Trinity, proceeding from the Father and the Son and co-equal with Them — to equate confusion with the Holy Ghost is not only blasphemy but it is also heresy! And to say that the Holy Ghost creates all the difference among churches — everyone should know by now that Francis includes all sorts and manner of heretics as members of the Novus Ordo church — wow, does this man have no shame? 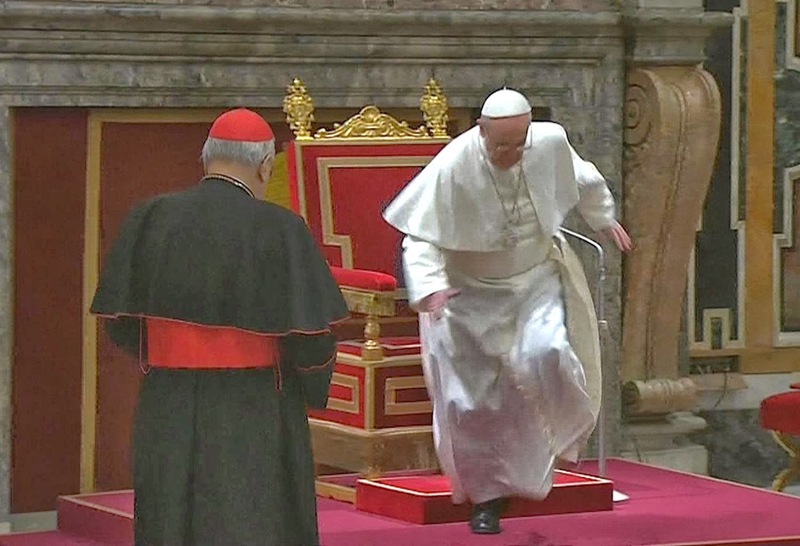 The only use we can find of Jorge using the Papal Throne took place in Sala Clementina at the Vatican City when he was introduced to the College of Cardinals on 15 March 2013. Upon getting off the throne Jorge stumbled but caught himself. The throne was gone the next day and replaced by a papal chair. God often speaks in signs is this one of them? Does it foreshadow what this papacy will bring, namely traditions which are inconvenient will be replaced with something new, novel, and easy but not necessarily Catholic? Parece como "si fuera un apóstol de Babel" is not translated "almost an apostle of Babel". It is "LIKE AN APOSTLE OF BABEL". Ever since John XXIII changed the Good Friday prayer for the Jews, the Novus Ordo False has been a Judeo-Masonic synagogue. The Revolution started with Pius XII. Bergoglio is a freemason's, a satanist's, a protestant's and a clueless useful-idiot-novus-ordite's dream. It's important to remember that there were faithful who kept the faith, following True Tradition, Scripture and History even from the time the black smoke followed in the wake of the white smoke after the death of Pius XII. This interregnum may just be the removal the one who holds back the antichrist; the restrainer mentioned in 2 Thessalonians. Pius XII started the revolution! !